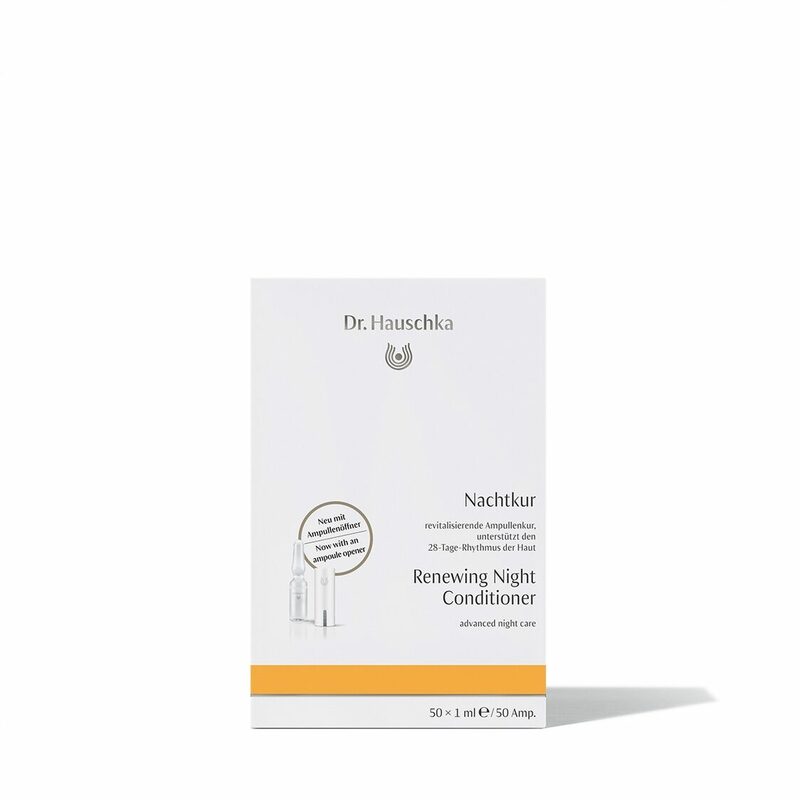 This oil-free night time skin care product from Dr. Hauschka allows the skin to breathe freely and reminds it of its natural renewal processes. Renewing Night Conditioner normalises the skin’s functions and stimulates its natural processes. Formulation: Rhythmitised medicinal plant extracts of witch hazel, madonna lily and silver, along with precious rose, bryophyllum (kalanchoe), marshmallow and sunflower support the skin’s essential night-time tasks of cleansing, balancing and renewal. Skin cells are renewed every 28 days. Mirroring this same regenerative cycle, Renewing Night Conditioner should be used for 28 days in place of a toner. Apply nightly, after evening cleansing. We recommend one 28 day cycle of Renewing Night Conditioner per year for each decade of life (for example 3 times a year at the age of 30). After cleansing, evenly apply the contents of 2 ampoules to the face (including lips and eye area), neck, earlobes and décolleté. In the 4th week, we recommend 1 ampoule. Press gently and evenly to skin until the solution has been fully absorbed. For mornings, we recommend the Dr. Hauschka daytime skin care products. For the nightly basic skin care routine, we recommend Night Serum or Regenerating Serum.